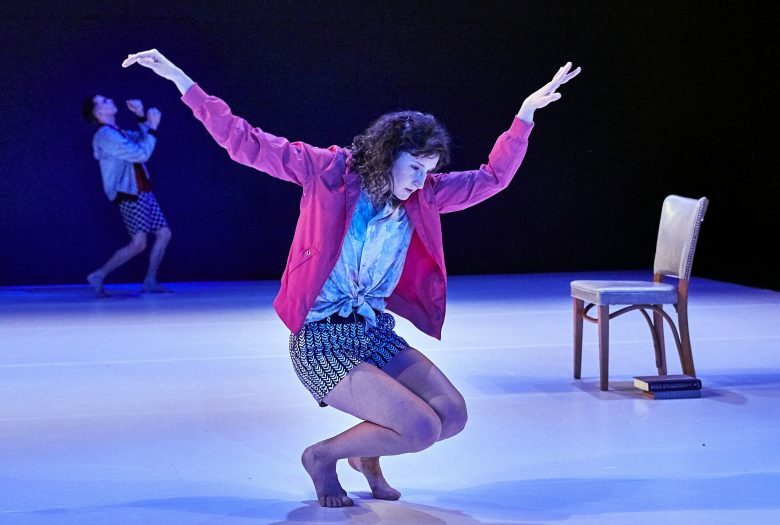 Revisiting work from the last 30 years, choreographer Susan Rethorst draws on the old bits and pieces to join new material in a work created for and with dancers Gabrielle Revlock and Gregory Holt. Rethorst savors little gestures and brackets them in delicious paragraphs that become evocative stories. She has said she is interested in “movements that were like found objects,” and has no fear of making challenging work. Some say the experience is like being transfixed by a great painting. Susan Rethorst, born in 1951 in Washington D.C., began modern dance studies at an early age. Tutorials with Judith Dunn at Bennington College laid the groundwork for Rethorst’s artistic sensibility. Since 1975, Rethorst has steadily created dances out of New York City. Since 1995, she has divided her time between New York and Amsterdam, teaching choreography throughout Europe and Scandinavia and continuing to make work in both Europe and America. She currently resides in Philadelphia. Rethorst’s work has been presented by The Museum of Modern Art; The Kitchen, Dance Theater Workshop, Danspace Project at St. Marks, The Downtown Whitney Museum, among others, as well as at various dance theaters, universities, and festivals throughout the U.S. Internationally her work has been produced by The Holland Festival, Spazio Zero Rome, The Kunsthalle Basel, The Aix-en-Provence Festival, Jerusalem’s Room Festival, among others. An internationally renowned teacher of choreography, Rethorst has been instrumental in devising BA and post-graduate programs in Copenhagen, Cork, Salzburg and Amsterdam. She initiated a program for the Amsterdam School of the Arts, a study of choreography in Studio Upson in Pennsylvania (SUPA), and the Center for Performance Research in Brooklyn. She has taught of led workshops and seminars on choreography in Helsinki, Barcelona, London, Jerusalem, Bennington, Ohio State University, Bard, NYU, Barnard, among others. A documentary of her teaching methods and philosophy is currently in production at La Caldera in Barcelona. Rethorst was among the first to receive a New York Dance and Performance Award (‘Bessie’) for Outstanding Achievement in 1985. In 2008, she received her second Bessie for 208 East Broadway: Suitcase Dreams. She has been the recipient of many grants from the National Endowment for the Arts, New York State Council on the Arts, the Foundation for Contemporary Performance, New York Foundation for the Arts, Ernie Pagnano Memorial Fund, Joyce Mertz Gilmore Foundation, and a Guggenheim Fellowship. In 2010 she received the prestigious Alpert Award, in 2014 a Pew Fellowship in the Arts, and in 2015 a Doris Duke Award. Rethorst has published articles on her choreographic thinking in Movement Research Journal and Choreographic Encounters and her seminal book “A Choreographic Mind: Autobodygraphical Writings” was published in 2012 by The Theater Academy of Helsinki. Gregory Holt is a choreographer in Philadelphia, where he also works as a community organizer. His dances are refined, process-based works, driven to look for social structures in somatic experience. His organizing work is in developing the local cooperative economy and direct action for climate justice. His work has been shown across the US, in Canada, and in Europe. He was a FringeArts LAB Fellow, and was an Artist in Residence at Mascher Space Co-op for 7 years. Gabrielle Revlock is a dance-maker known for her work with the hoop and her “inventive,” “rambunctious,” and “mesmerizing” choreography. Presenters include American Dance Festival, JACK, Gibney Dance Center, FringeArts, Joyce SoHo, and Annenberg Center for the Performing Arts. Internationally she has performed in Japan, Netherlands, Singapore, Hungary and Russia. Her work has been supported by The Pew Center for Arts & Heritage, Independence Foundation, a LAB Fellowship through FringeArts, PA Council on the Arts, SCUBA National Touring Network for Dance, Puffin Foundation and the US Department of State. In 2011 she won a finalist prize at The A.W.A.R.D. Show. Choreographic residencies include Chez Bushwick, Elizabeth Streb’s GO!, LiftOff, Dance Omi, Culture Mill in cooperation with American Dance Festival and New York Live Arts’ Fresh Tracks. As a dancer, she has performed for Lucinda Childs, Leah Stein, Jumatatu Poe, Christopher Williams, Bill Young, Jody Oberfelder, and is a company member with Jane Comfort and Company. This is her second project with Rethorst. Revlock teaches experimental hooping and has taught at The Fabric Workshop and Museum, American Dance Festival, Barnes Foundation, Abrons Arts Center, and The Philadelphia School among others. Interested in bridging experimentation and populism, she created the online video “So You Think You Can’t Understand Contemporary Dance?,” a two-minute conversation with her favorite five-year-old. Gabrielle holds a BA in Art History from Vassar College. Up next: GO! final showing, June 22-23 at SLAM in Williamsburg. [DANCEROULETTE] is supported, in part, by the Mertz Gilmore Foundation, the Harkness Foundation for Dance, the National Endowment for the Arts, and the New York City Department of Cultural Affairs.